I think that once past the learning stage and having large enough vocabulary to allow for free expression in nearly every situation, all foreign English speakers can call themselves fluent. Yet the process of improving one’s spoken English is lifelong, and it inevitably involves learning new English words and phrases on a regular basis. Bulk of that new vocabulary is picked up naturally during conversations with other English speakers, and to tell you the truth – anyone who spends a lot of time among English speakers will grow their vocabularies even if they don’t put much conscious effort into the process. If you’re eager to improve your English at a much faster rate, however, I bet you’re making sure to learn an extra number of new English words every now and then, don’t you? Well, if that’s the case, I’ll also hazard a guess that sometimes you’ve been wandering on what grounds you should choose new English vocabulary words to learn. Should you learn all new English words that come along regardless of how obscure they may be? Should you learn English word lists using online services such as Word Dynamo, for example? Or should you write down every new word you come across when reading English fiction and make sure you memorize them? If you often ask yourself such and similar questions, the rest of this blog post is definitely going to shed some light on the issue! 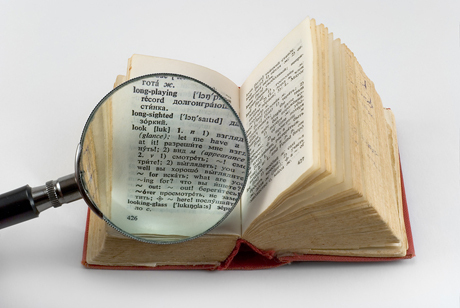 Don’t look for new English words – let them find you! It’s even better if you work in an English speaking environment or live in an English speaking society – you simply won’t be able to avoid new English words bombarding you on a daily basis, so I don’t really see a problem with finding them! if you choose to write down new English vocabulary – use other English words to explain it and stay away from your native language as much as possible! whenever possible – learn those new words in the context (memorize typical word combinations including that word); the worst thing you can do is learning a separate word followed by a translation in your language! Jot down random words crossing your mind. I have situations when an odd English word suddenly crosses my mind – a word I’ve heard previously but whose meaning I still haven’t figured out. What you should do in situations like this is – jot the word down on a piece of paper so that you can look it up on an online dictionary, an iPhone app or a hardcover dictionary later on. I’d say you definitely have to take advantage of this fact, because normally you’d make some effort to learn a new word or expression and it would require a few repetitions to memorize it. In this case memorization has been already done by your brain and all you have to do is clarify what this word means and in what context it’s used! Whenever you’re stuck for words – find out the English word you’ve been looking for and learn it! When you’re having those moments when you feel you’re struggling to explain yourself properly because you can’t think of the exact word, the right thing to do is – paraphrase, use other words. But you should still make the effort and figure out that exact word so that you can step it up a notch and make your spoken English more fluent and native-like. Let’s say for instance, you need to cash a check so you go to your local bank to deposit the check into your bank account. You’re waiting in a line and when your turn comes you’re saying to the person behind the counter: “Hi, how are you? I’d like to cash this check, please! And can you also …” and this is when you hesitate a little bit because you have a feeling that there is a word describing the process of putting money into a bank account, but you just don’t know the word. You finish off the sentence by saying “… put that money into my bank account?”, but what you should do right after that is – find out if there’s another, more specific word that you could use to describe the same action. When you find out that it’s the word ‘to deposit’, you can memorize it if you hadn’t heard it before; it’s going to be even easier if you knew the word but just didn’t know that you can use it as a verb. In either case, you should memorize the whole phrase “to deposit money into my account” to make sure you can use the new word in a similar situation. Also, bear in mind the worst thing you can do is – learn all meanings and applications of the word ‘deposit’ at once. If you do so, you run the risk of creating unnatural mental associations between them all that in turn may impede your English fluency! As for accessing the program on your iPhone – please use the Puffin Browser app http://www.puffinbrowser.com/index.php and you’ll be able to do it without any problems at all! although we need a real feedback to have a chance to apply the new acquired word. Yeap, it’s definitely a great idea – as a matter of fact, keeping a vocabulary notebook is a must when you acquire new English words! Just make sure to include some context with those words – never write down just a single word but use the whole phrase or sentence that has that word in it! A idea popped onto my mind this morning. Do you think it’s wise to write down the new words i just learned in a notebook, with english translation. And where i go to look at them, and to make some conversation with myself? Because, if i don’t look couple of time on them, i will forget them. Do you think it is smart move? You know Maybe because i learn to many words in one day, i get overwhelmed? I used to learn 10 idioms per day, use in my English speaking practice and also i have 10 new words plus. So, to keep learn new words every day, let’s say to be 8 words per day and also idioms too. And do not use any new words after it, and to stop reading? So i can use these new words and idioms whole day with different subjects? So you’ve got VISUAL memory which facilitates the memorization process if you acquire new English vocab based on your reading. There’s nothing wrong with that obviously for as long as you put those new words and phrases to practice and I salute you for that – not everyone is as determined as you in terms of spoken practice! One more thing I can tell you as to WHY it’s easier for you to acquire your vocab based on reading – it’s because you’re INTERESTED in what you’re reading and it’s all CONTEXTUAL. To be honest with you Robby. I always had problem memorizing new English words, I am not sure what;s wrong with me. I used your advice,but i can’t still remember them. ONly if i read them. I stick to learn 10 or 6 words per day. I read book, write down new phrase or english word, then, immediately, i start speak with my self, using these words all day long. I also try to remember new phrases 10 per day. It contains the most commonly used English phraseology and it’s spread among 60 speechÂ exercisingÂ lessons each focusing on different situations an average foreign English speaker may find themselves in! Other than that, it’s quite hard for me to give you an exhaustive list of the most important vocabulary in conversations. Thank you very much Robby , But can you give me the most important vocabulary in speaking ? Thanks, I’m glad you find it useful! I’ve built my English vocabulary based on my personal needs, interests and preferences; living in an English speaking society allows you to absorb new vocabulary in real life situations so there’s less need for specific literature etc.u00a0nnBut even if you don’t have much real-life communication opportunities I’d rather suggest to engage in as much reading, watching films, reading stuff online etc. as possible and learn new words as you encounter them.u00a0nnIf you build your vocabulary from a specific book, you’ll also learn many irrelevant words, I’m afraid. Oh , by the way any suggestions for vocab building except ‘Word Power made easy’ by N.L ? When I learn another language, the words I choose to learn are the ones I feel I need the most. I hear myself saying: “How do I say this in Czech or French?” nnOften it’s not just a word, but a whole phrase, + quite often a function such as how to recommend something, respond to something, give good news, etc. It words better for me to be less worried about the grammar of it.